Earlier this month I had one heck of a bad day. I don't know if it was my tummy ache or I've read one too many books that had too much drama in it, but I was in a seriously bad mood. I figured maybe I just need to read something not on my review list to desensitize myself; a book that I've been meaning to read for quite some time. Something light and fun, I thought. 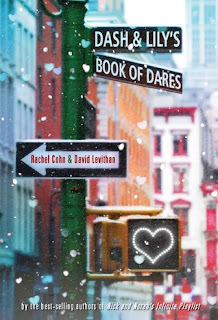 Hence, Dash & Lily’s Book of Dares. Right from the start, I got what I wanted: fun. This book was such a light and fun read that you'd be crazy not to want to try it out. I really had fun reading Dash and Lily's dares. They were so creative and imaginative! The dares were truly reflections of the protagonists themselves. Dash was his own brand of witty; his insights on Christmas and his experiences during the season were fun to read. Lily on the one hand was... well she was charming in a quirky way. I liked how they were able to figure out the next stop for the dares (particularly the first dares Dash did) and what they did to fulfill each one. That alone satisfied my craving for a fun read! As for the other parts that didn't involve their dares, I think the authors did a great job at creating solid back stories without over complicating things. I got a glimpse of the protagonists' lives, them without the quirkiness, and why they have a thing (or a lack of one) for Christmas. I also liked how it was a hit and miss for Dash and Lily whenever they'd try to meet up. The bad timing was a bit frustrating, yes, but it was sweet in a way because the moments they did get to spend together were aww-worthy. I'm so glad I decided to read this. It totally got rid of my crankiness! I wish I read this during Christmas break so I would've enjoyed the Christmas-y feel of the book more. But not to worry. I bet you'll enjoy it as much as I did even if you don't read it during Christmas like me! I guess as long as it's a good book, it's a good book right?